Willis Towers Watson and research firm CB Insights released in December their Quarterly InsurTech Briefing for Q3 2018 that discussed recent investments and market trends, and took a deep dive into the emerging parametric insurance market. The report’s InsurTech Data Center noted $1.3 billion in funding among 57 reported transactions in Q3 2018. The majority of the funding, including eight transactions over $40 million each, came from the (re)insurance and VC-backed tech space, a trend we have seen in previous quarters. All in all, the pipeline of insurtech partnerships continues to grow as (re)insurers explore new opportunities to reduce friction, access new markets and improve operational efficiencies. The firms also took the time to dissect the recent trend of parametric insurance and explored how firms are leveraging emerging technologies to address inefficiencies and fill coverage gaps in the existing insurance ecosystem. Parametric insurance, also known as event-based insurance, differs from the current traditional model in one crucial way. In the traditional model, a loss event must meet two key conditions: the covered event not only must take place, but the loss incurred by the insured must also exceed the deductible. In contrast, the term event-based/parametric insurance captures policies that do not have that second condition, i.e., if the covered event takes place, the payment is made regardless of the loss experienced by the insured. While advantages in offering parametric insurance may be limited for the broker, the insured can quickly experience the benefits of such coverage after a catastrophic event (i.e., no lost adjustment period and faster claims payments). Complexity and friction costs (claims management, for example) are inherently reduced under this paradigm. 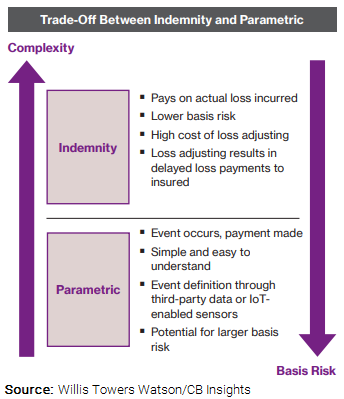 All the insurance company needs to pay a claim is verification that the event occurred, which is captured through advanced sensors and connected IoT devices. Since the severity of the event is predetermined, “pricing becomes a function of frequency” alone, rather than of the “interaction between frequency and severity,” all of which leads to more affordable coverage and quicker loss payments to the insured. For example, one of the companies profiled, a UK-based firm called FloodFlash, developed an external water-depth sensor for a house or place of business. The company’s insurance offering allows the insured to “determine the event (water depth) as well as the event payment”. Jumpstart, a startup in California that aims to address the vast coverage gap in earthquake insurance (in 2016, only 10 percent of households in California purchased coverage) through leveraging available earthquake modeling techniques and third-party data sources to automate their underwriting and other business processes. If a policyholder is in an area where intensity of the earthquake exceeds a certain threshold, a simple verification process occurs, and then a payment is automatically deposited into the policyholder’s account (usually within 24 hours). The industry’s interest in Parametric is evident in the numbers. According to Coverager, total parametric insurance investments in 2018 reached over $975 million, which is up from $77 million in 2017 and $2.6 million in 2016.